Kaiserslautern was the second largest city in the Palatinate, Germany (coordinates: 49.444722, 7.768889 [49° 26′ 41″ N, 7° 46′ 8″ E]) with a population of 80,000 in 1955 (99,790 in 2011). Since 1896 it was the location of a Mennonite congregation which in 1954 numbered 67 baptized members. It was united into a single church with Zweibrücken, Kühbörncheshof, and Saarland. In Kaiserslautern there were Mennonites in the 16th century. In 1566 the preacher Sylvanus notified the council that some Anabaptists had slipped into the city, especially a master cooper, Balthasar Bender, who should be questioned. In the hearing Bender refused to take the oath, and said he would not take part in war. He had also taken a wife who did not attend church here. They were banished from the city. "He thanked God that he must suffer somewhat for His name, and would leave the city" (Küchler, 11-12). On 18 April 1595 the Anabaptist Barthel Lorch said he would let himself be hanged on a tree before he would go to church. In 1730, in the procession through the city forest, some Anabaptists from Aschbacherhof, Christian Knebel, Hannsz Jacob Hirsch, and Clauss Ochsel, were lashed by the city authorities. In 1740 Kaiserslautern was instructed to raise a troop of militia to serve six years; but the city was to send no Anabaptists, Jews, "or other rabble," for such would not be accepted (Küchler, 615). The Mennonite lists in the Karlsruhe archives state that in 1724 a Mennonite was living as owner at the city mill. In 1738 Heinrich Jordan, Ulrich Gindelsberger, and Jakob Guth were living in the city, but nothing more is said about them. They were perhaps from the nearby Eselsmühle, where there was an Amish congregation until the middle of the 19th century. The Dutch Naamlijst (1775 ff.) mentions a congregation near Kaiserslautern with Christian Schenck and Christian Imhoff Jr. as preachers. The Amish congregation held services alternately at Obermehlingen, Willensteinerhof, Horterhof, Ingweilerhof, and Schallodenbach; in the 50s they rented a hall at Eselsfurth, in which they held services every three weeks. The elders were Johann Maurer of Obermehlingen (d. 1850) and Johann Imhof of Willensteinerhof near Trippstadt (d. 1857). The preachers were Jakob Ehresmann of Dörrmoschel and Daniel Schönbeck of Ingweilerhof. In 1772 the Mennonite Christian Raque acquired the Lichtenbrucherhof near Kaiserslautern for 115 guilders (Zink, 272). The families of Jakob Oswald, Lorenz Walter, Johann Christian Höfli, Jakob Latscha, and Hans Joder were living on neighboring farms as for instance the Mückenhof, and Christian Lichti in Rothselberg near Wolfstein. In 1744 the administration still ruled that no public service or permission to marry be granted them, and that they should not be permitted to stay in Kaiserslautern (Küchler, 642). In 1780 the council inquired by what plan the dead of the three Christian creeds were buried in the common cemetery. The answer was given that all the dead were laid strictly in the order of their death and that there were no separate plots. But that there were exceptions is shown by the magistrate's order that the exhumed Mennonites were to be reburied at once in the original place (Küchler, 745). This probably refers to the following shocking instance of intolerance in 1780. Among the laborers in a yarn spinnery were two Mennonites, J. Dietrich and Johann Strohm. The wife of the former died and was buried in the common cemetery. When the Catholic clergy learned that an Anabaptist had been buried there with the honors of the church, they set all wheels in motion to punish this crime. They managed to have the body exhumed at night and buried outside the cemetery. All efforts of the management of the factory and their attorney to have the deceased given an honorable burial were futile (Gemeinde-Kalendar). In 1878 the three congregations in the neighborhood of Kaiserslautern (Neudorferhof, established in 1700, meetinghouse 1866; Kühbörncheshof 1832, meetinghouse 1832; and Ernstweiler 1680), which until that time had been independent congregations with lay preachers, united to employ a trained and salaried preacher, who assumed pastoral care of the three groups as a circuit and preached at the three places in rotation. Although none of these older congregations was located in the city they jointly assumed the name Kaiserslautern for their circuit of three groups. In 1896, however, a congregation was organized in Kaiserslautern and added to the group, enlarging it to four units. The Ernstweiler group united with Ixheim in 1936 and took the congregational name of Zweibrücken. In 1949 the remnants of the former independent Saargebiet congregation organized themselves into a "Saarland" congregation and affiliated with the Kaiserslautern circuit. In 1951 Neudorferhof detached itself from this circuit and affiliated with the Sembach congregation. The circuit was served by the following ministers: S. Blickensdörfer 1878-1880; Abraham Hirschler 1880-1931; A. Harder 1931-1937; Hugo Scheffler 1937-1951; Theo Hotel 1951- . The baptized membership of the four units of the circuit in 1954 was as follows: Kaiserslautern 67, Kühbörncheshof 159, Zweibrücken 201, Saarland 61; total 488, plus 163 unbaptized children. The meeting places were rented halls in the cities of Kaiserslautern and Zweibrücken, and the rural meetinghouse of Kühbörncheshof. The Mennonite Central Committee (MCC) began a relief program in Kaiserslautern in early 1947, which developed into a social welfare work. In gratitude for this help, the city government named one street "Mennonitenstrasse" and donated a plot of ground in the center of the city, on which in 1955 the MCC erected a building containing administrative offices, a residence for workers, and a meeting room for church services. The MCC program in Kaiserslautern began with childfeeding, added a home for the temporary care of undernourished children from Berlin, and in 1949 a neighborhood center (Nachbarschaftsheim) in a building supplied by the city. Hege, Christian and Christian Neff. Mennonitisches Lexikon, 4 vols. Frankfurt & Weierhof: Hege; Karlsruhe: Schneider, 1913-1967: v. II, 452. Küchler, J. Chronik der Stadt Kaiserslautern aus den Jahren 1566-1798. Kaiserslautern, 1905. Zink, T. Kaiserslautern in der Vergangenheit und Gegenwart. 1914. Neff, Christian and Harold S. Bender. "Kaiserslautern (Rheinland-Pfalz, Germany)." Global Anabaptist Mennonite Encyclopedia Online. 1957. Web. 18 Apr 2019. http://gameo.org/index.php?title=Kaiserslautern_(Rheinland-Pfalz,_Germany)&oldid=145552. Neff, Christian and Harold S. Bender. (1957). Kaiserslautern (Rheinland-Pfalz, Germany). Global Anabaptist Mennonite Encyclopedia Online. 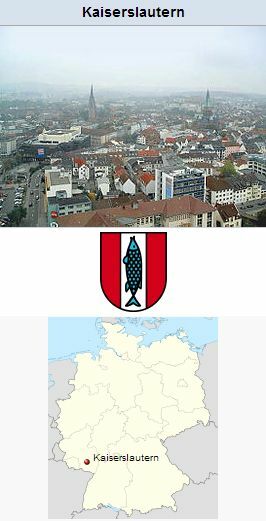 Retrieved 18 April 2019, from http://gameo.org/index.php?title=Kaiserslautern_(Rheinland-Pfalz,_Germany)&oldid=145552. Adapted by permission of Herald Press, Harrisonburg, Virginia, from Mennonite Encyclopedia, Vol. 3, p. 136. All rights reserved.